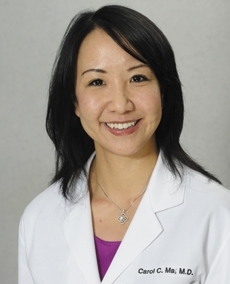 Carol Ma, MD, FACC, is board certified in internal medicine, echocardiography, nuclear cardiology and cardiovascular disease. Shes pecializes in cardiovascular disease prevention, valvular heart disease, women’s heart disease and women’s health. She earned her medical degree at the University of Florida and completed her residency training at the University of Maryland Medical Center in Baltimore. She completed her fellowship in cardiology at the University of Miami/Jackson Memorial Medical Center in Miami. Dr. Ma is an active member of the American College of Cardiology, the American Society of Echocardiology and ACC Women in Cardiology.